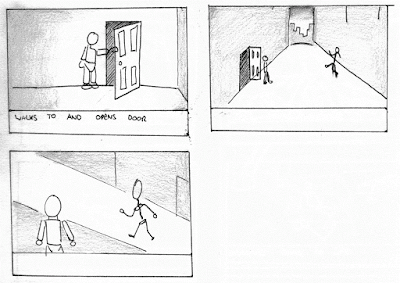 This is my first storyboard for the final short animation I will make for this year. I wanted to try animating with a proper stop motion armature and wanted to experiment with the idea of an exposed armature adding materials onto itself. 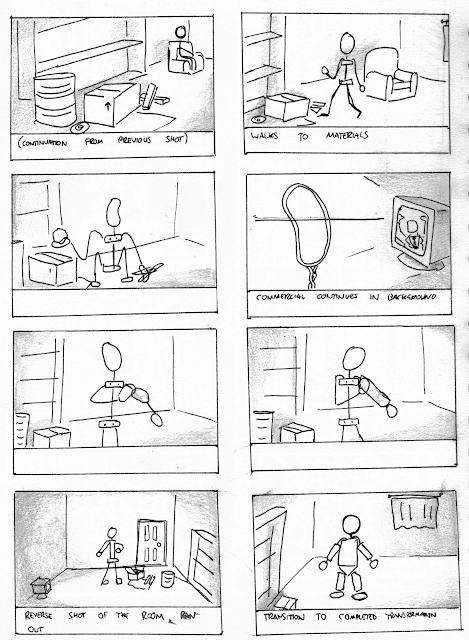 These sketches/doodles played with the idea about characters that built themselves from materials around them. They’d often be comprised of bits of junk, wire and bits of clay. 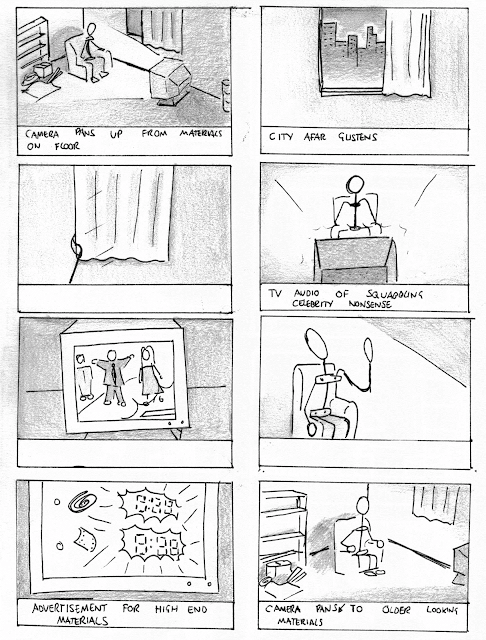 A small story came to mind which produced these sketches which I built upon to flesh out a story from. 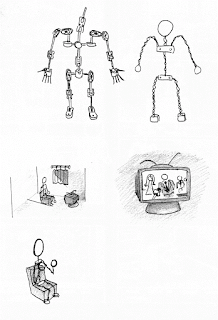 In this animation, an armature character would be watching television in his apartment. The big city outside would be shining light in. The TV would be spewing infomercial-style claims about “being complete” and would show famous people (in the context of this world) boasting about their lifestyle. Advertisements for high quality building materials entices our character but he already has some lower quality materials for himself. He looks through his hands, showing a contrast to “being complete” that he is seeing on the TV and through his window. He takes it upon himself to gather his materials and build himself a makeshift body. The animation would end with his completion. He would leave his apartment and exit into the world. I’m not entirely set on the ending but one interpretation was he realised most people in the world was just as incomplete as he was and that no-one is actually “whole”. My idea was to have other people walking in the street who would maybe react to the main character. Some may be accepting of him, others not. The character may realise he’s faking his appearance or he may embrace the makeshift unique-ness to it. From here, I will expand upon this idea and turn it into an animatic which will give me a better idea of the timing and pacing of the story. 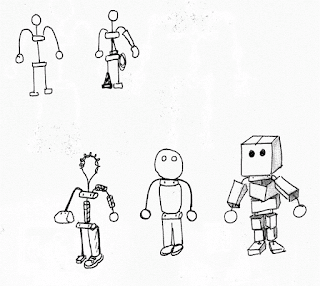 I will also look into acquiring an armature model and clay. Any sets would be built from cardboard and painted. I will mostly “wing it” when building these, and see what materials and composition works in front of the camera. Lighting this set will be a strong point for its overall look and atmosphere.